Journal of Psychiatric Intensive Care is devoted to issues affecting the care and treatment of people with mental disorders who manifest severely disturbed mental or behavioural functioning. The journal is international and multi-disciplinary in its approach. It serves the interest of all professionals concerned with these topics whether they work in Psychiatric Intensive Care Units (PICUs), Low Secure Unit, Challenging Behaviour, Emergency Psychiatry, Intensive Treatments or in other parts of the wider mental health system. 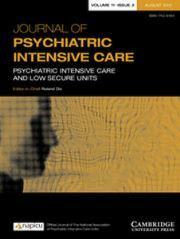 All aspects of psychiatric intensive care are covered within the journal that seeks to encourage informed debate and exchange of opinion and thereby become the essential journal in this field. The content of the journal includes editorials, original articles, brief reports, reviews, conference reports, news and notices. Preference is given to original research of a high scientific quality.